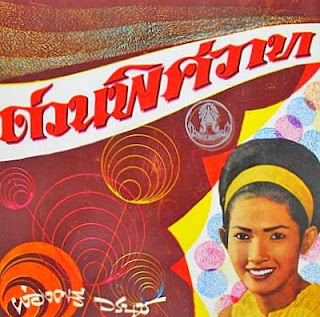 this week, more great songs from luk thung legend and national artist phongsi woranut! phongsi grew up in chainat province, sellings sweets with her mother from a rafthouse on the chao phrya. she started out performing in local street theatre troupes, and rose to fame with her wildly popular responses to the hits of suraphon sombatcharoen, giving luk thung it's first female star. but their friendly rivalry turned serious and phongsi struck out on her own, starting her own band which would launch the careers of many future stars (most notably sayan sanya). the songs on this collection are some of her earliest, recorded between the years 1958 and 1963. very sweet old-fashioned sounds here, enjoy! Think she is 72 this year and has a first part of her auto biography in the shops at 200 baht, have not been able to find it yet. Not a favorite voice of mine, but have met her once and seen her sing a few times, very nice lady. ah wow, i would love to read her autobiography.. i have read some some great stories by her, she has such an insight into the early luk thung industry! i will have to find a way to get that in america, thanks for telling me! There was an article about her in dara pakayon magazine this week mentioning the book. She's 71 next year not 72. If I see the book will let you know.